As the digital world continues to expand, people rely more and more on search engines like Google to locate the information they need, whether it’s how to identify a pipe leak, the correct way to repair a leaky faucet, or the phone number for a plumber in their area. Local SEO tactics use geographic information along with keyword placement, formatting, and other SEO techniques to rank in “near me” and other geo-targeted searches. The purpose of digital marketing for plumbers is to generate high-quality leads. That means generating leads within your service area. If you own a plumbing business in Battle Creek, Mi, you can’t follow up on a lead located in Dallas, Tx. That’s why the team at Plumbing Webmasters focuses your search engine optimization (SEO) locally. Research shows that local ranking factors help businesses optimize for actual potential clients. Since Plumbing Webmasters offers local SEO services to companies country-wide, we focus on the following elements to improve your business’ local optimization. Local Keywords: We study and apply local keyword searches and trends to your strategy. Online Citations: We use link-building and name, address, and phone (NAP) management to build your business’ online credibility. Review Management: Plumbing Webmasters takes over your online reputation by monitoring and responding to online reviews. Social Media: We ensure that your social media accounts like Facebook, Twitter, and Instagram stay active. Mobile device optimization is imperative for building your online presence. More users search for plumbing service on their mobile devices than ever before. That means that your local SEO needs to include mobile optimization. If a potential client has to wait on your website to load on their phone for longer than two seconds, they’re more likely to navigate away from your site and to a rival plumbing companies’ than to wait any longer for your webpage to load. Google introduced accelerated mobile pages and micro-moments to enhance the search engine experience for mobile users. Call the local SEO experts of Plumbing Webmasters at (877) 388-9884 to learn more about generating more actionable leads today! Your website must be optimized for local searches for your plumbing business to see the maximum benefits of local SEO. The Plumbing Webmasters team offers multiple levels of content marketing services. 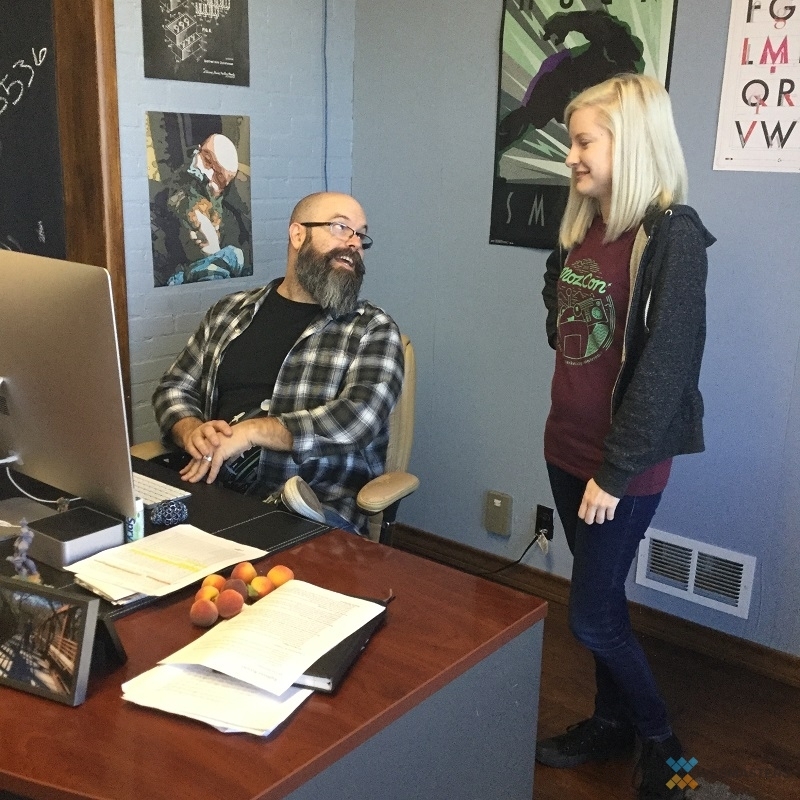 Our content writers produce completely original and unique content. Some people try to scrape content from other websites, which devalues your website according to Google’s quality guidelines. Our writers ensure that your websites’ content is informative, engaging, unique, and relevant. They also make sure that you never have duplicate content on your page that could confuse potential customers. We online content creation team uses the following techniques to boost your business’ online presence for local searches. Blogging: Monthly blogging keeps your site active and engages local users with posts aimed at things affecting them specifically. A good example is a blog post about frozen pipes in the winter months. Keywords: Our team researches keyword trends and adds the appropriate elements to your monthly blogs and website. NAP: By displaying your business’ name, address, and phone number information on your home and contact pages. We also ensure that your NAP entries are consistent on different website directories. Schema: We mark up location information to display on search engine results pages (SERPs) to appeal to local users. 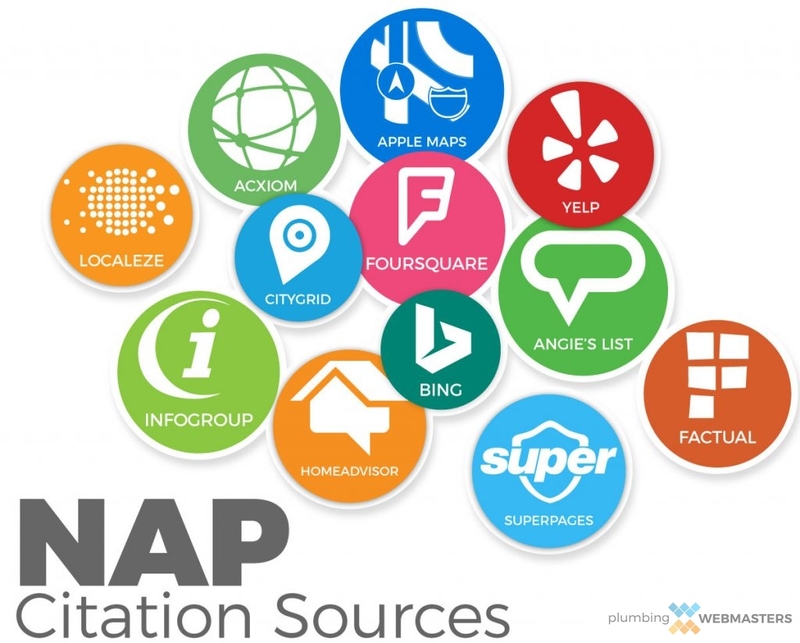 These Popular Digital Platforms are Top Sources for NAP Citations. Google SERPs are the pages that display different options for users searching online for services or information. After someone enters a query into the Google search bar and hits enter, the following pages are SERPs. If a person searches for specific services, their location heavily affects their results. The first results that appear are pay per click (PPC) advertisements that other plumbing companies have paid for by bidding through Google AdWords. If the search query is a question or has been searched for many times, there could be a featured snippet. These answer questions based on informative content from subject matter experts. The next results are the true, organic results. This is what your plumbing company should try to achieve, as potential clients are usually more likely to click on organic search results than results that are clearly labeled advertisement, or “Ad.” The Local 3 Pack is at the top of these results. It is a group of usually three map listings for businesses in the users’ area. The best way to get your plumbing business into the Local 3 Pack is by local SEO and having a high number of positive user reviews. Contact Plumbing Webmasters to learn more about getting your plumbing business’ website to the top of the search engine results through local SEO by calling (877) 388-9884! 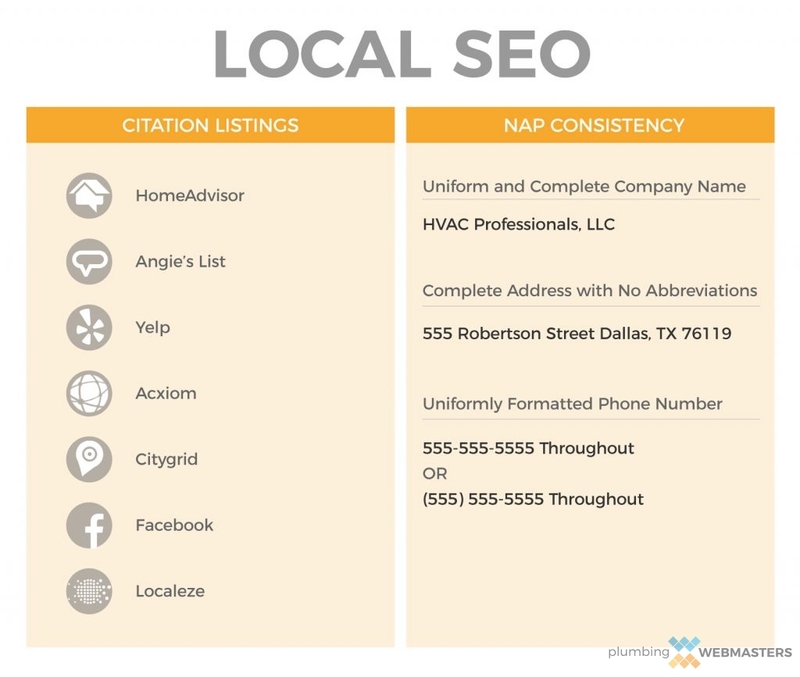 Uniform NAP Citations are an Integral Part of Local SEO. Cleaning up your online citations is just as critical as website content optimization. Sometimes online business directories have duplicate listings or inaccurate information related to your plumbing business. Most of these incorrect listings are from data aggregators who give out inaccurate information about your business. The content optimization team at Plumbing Webmasters takes over and ensures all of your online directory listings are accurate and have consistent data for potential users. Google My Business, Facebook, and Yelp are the most significant business directories to optimize for local SEO, but Plumbing Webmasters doesn’t just optimize your actual listings. We ensure that data aggregators giving out your business’ information have accurate and consistent listings so that future directory listings are accurate as well. Then we claim the most valuable business directory listings and locally optimize all related content for local SEO. Contact Plumbing Webmasters at (877) 388-9884 to learn more about accurate business directory information and local SEO today! Updated on April 1, 2019 at 7:20 pm by Plumbing Webmasters.